Personalized Travel Umbrellas in case, Custom Printed in Bulk. Promotional, Very Inexpensive. 37" arc fold to only 6 in.! Bulk custom imprinted Travel Umbrellas in posh EVA (expanded rubber) matching cases . We also supply wholesale blank (not imprinted) Travel Umbrellas for $9.97 each (minimum quantity: 25). 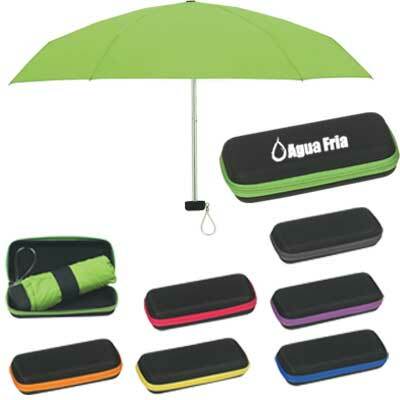 Budget Prices in USA and Canada for wholesale promotional Travel Umbrellas. American clients pay no taxes.